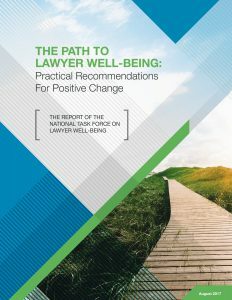 Here is The Path to Lawyer Well-Being: Practical Recommendations for Positive Change from the National Task Force on Lawyer Well-Being. The Task Force* was created in 2017 in response to the findings of the 2016 ABA Hazelden Study. This report’s recommendations focus on five central themes: (1) identifying stakeholders and the role each of us can play in reducing the level of toxicity in our profession, (2) eliminating the stigma associated with help-seeking behaviors, (3) emphasizing that well-being is an indispensable part of a lawyer’s duty of competence, (4) educating lawyers, judges, and law students on lawyer well-being issues, and (5) taking small, incremental steps to change how law is practiced and how lawyers are regulated to instill greater well-being in the profession. * The Task Force included the ABA Standing Committee on Professionalism; ABA Center for Professional Responsibility; ABA Young Lawyers Division; ABA Law Practice Division Attorney Wellbeing Committee; The National Organization of Bar Counsel; Association of Professional Responsibility Lawyers; National Conference of Chief Justices; National Conference of Bar Examiners and the ABA Commission on Lawyer Assistance Programs. The first nationwide empirical study in 25 years confirms lawyers have significant drug or alcohol problems or mental health problems, more so than other professionals or the general population. And lawyers are not seeking the help they need, for the wrong reasons. Researchers hope this data will promote change within the profession. This article summarizes and captures some of the highlights and most notable statistics from the empirical study conducted by the ABA Commission on Lawyer Assistance Programs and the Hazelden Betty Ford Foundation, published in the peer-reviewed Journal of Addiction Medicine in February 2016. The actual research article is to the left, and below is a companion article more suitable for distribution at CLE events or Bar functions. North Carolina CHief Justice’s Commission on Professionalism State of the Profession and Quality of Life Survey. North Carolina Chief Justice’s Commission on Professionalism State of the Profession and Quality of Life Survey. Random Sample Report.